It’s on sale for only $10 here . Found on Remodelista – a lauder of all things modern, simple and industrial. I’ve had this on my to do list for quite some time now, but today two things happened. #1: I finally found the citric acid I have been looking to find for weeks and #2: We totally ran out of detergent and needed to run the dishwasher. 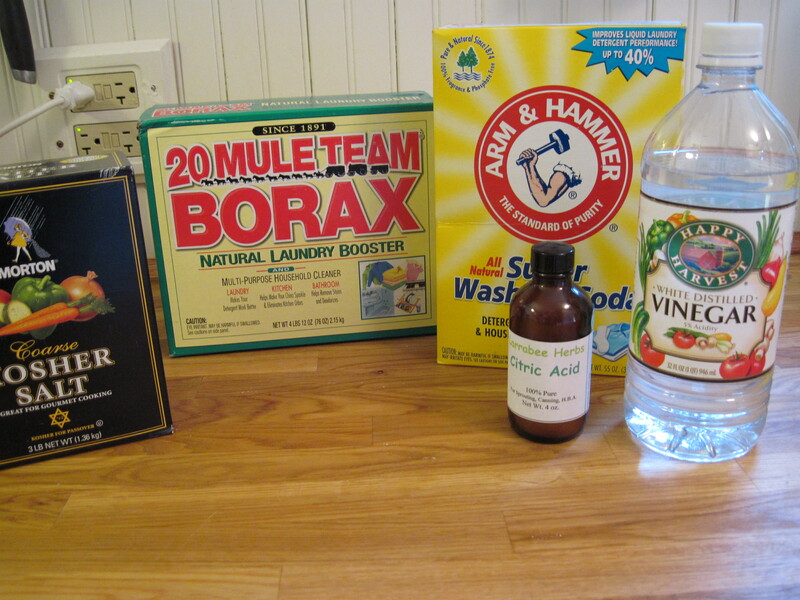 List of ingredients: Kosher Salt, 20 Mule Team® Borax, Arm & Hammer® Super Washing Soda and Citric Acid. (Also pictured is vinegar for the rinse aid- Did you know you could use it instead of Jet Dry? 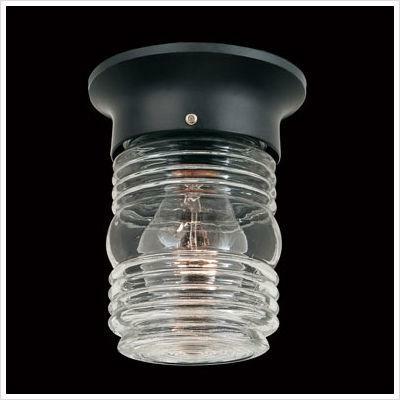 It’s great and MUCH cheaper!) I found all the ingredients at our grocery store except for the citric acid. That I found at the local health food stores, although it is sold online and you could also substitute lemon kool-aid packets or some say just do without. Directions: Mix 1/2 cup Borax, 1/2 cup Washing Soda, 1/4 cup kosher salt, and 1/4 cup citric acid. Shake it up and use 1 T for every load. The savings are noteworthy coming it at $.05 a load! I’ve researched out there and felt that the addition of citric acid was pretty important to avoid cloudy dishes. One site that was particularly helpful in the venture was diynatural.com. Find their article and cost breakdown here! Quite inspiring. Next comes laundry soap! Kinda different now. 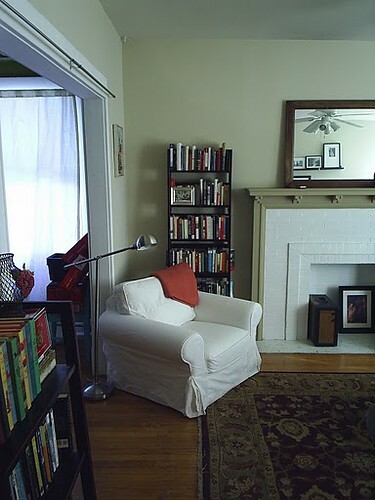 We made those picture ledges behind the couch, and we sold almost all of that furniture (couch, chair, coffee table). 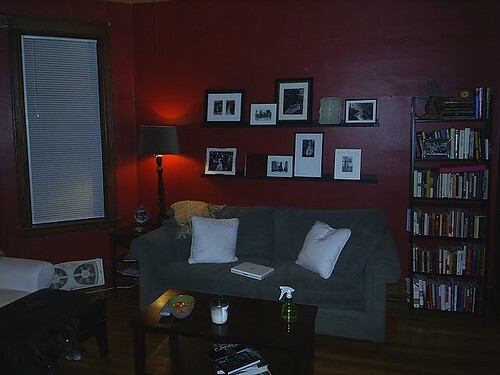 You can also see one of my favorite old accessories in the bottom left corner – my old chocolate lab who died just before we moved out of this apartment. 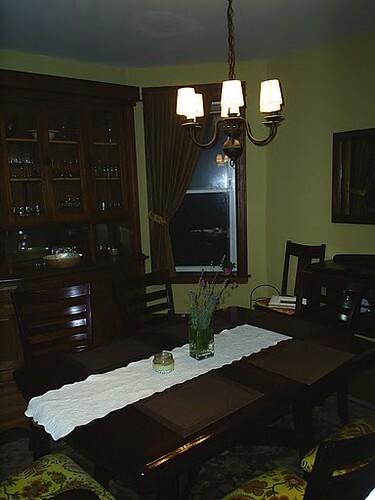 We spray-painted a brass chandelier and added little lamp shades to get that light fixture. The best part of this room was the big built-in hutch in the background. That island came in handy for cooking. Plus, we were able to fit a table and two chairs in the corner. 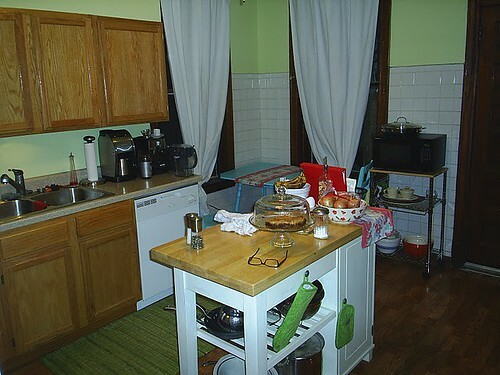 You can’t really see the table and chairs, but it’s the same one we have in the kitchen today – we just repainted it to match our current digs. Catherine made those curtains. That armoire housed our television and DVD player. 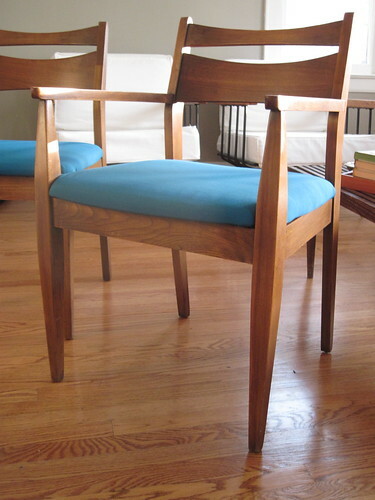 Those dining room chairs are the ones we’d recovered with thrift store curtains we found. That’s actually a window to the right, but it’s a shower curtain covering it. 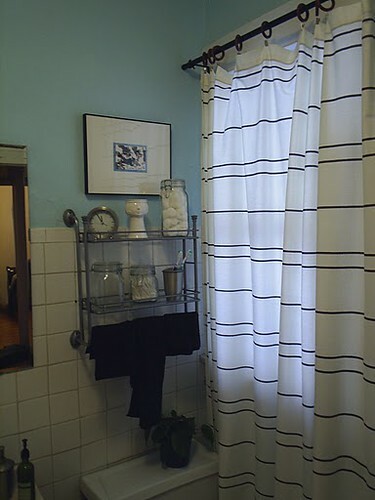 We used the same shower curtain on the shower to the left. 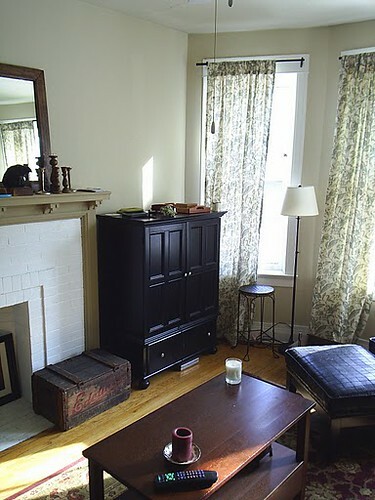 And I don’t know how well you can see it, but there’s a head-shaped vase there that one of us hates and one of us loves. We play a game where one of us puts it on the mantle and the other hides it somewhere. Can you guess who hates it?? So, that’s a little of our evolving style. Much of it translated into our new place, but some things have definitely changed. 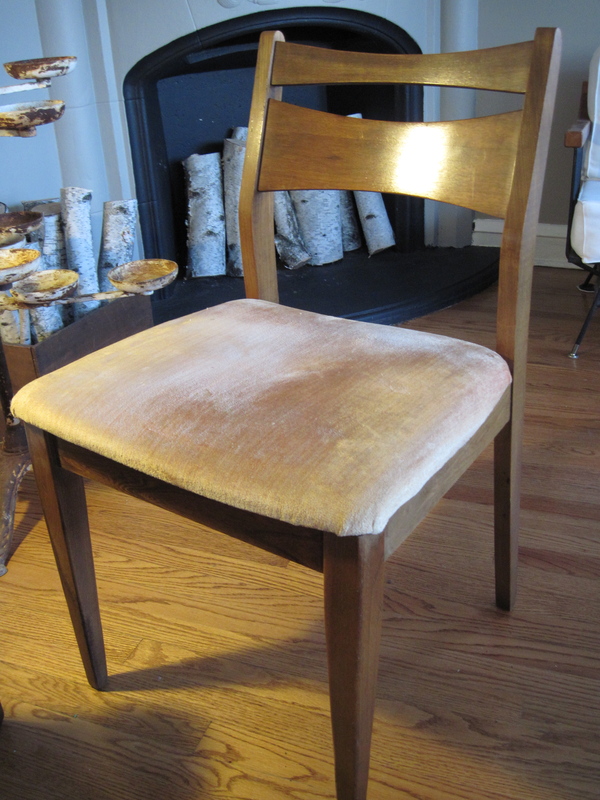 Not too bad, except in reality the shade of the seat is a strange peachy/cream color, and the velvet material was dirty and crusty in spots. 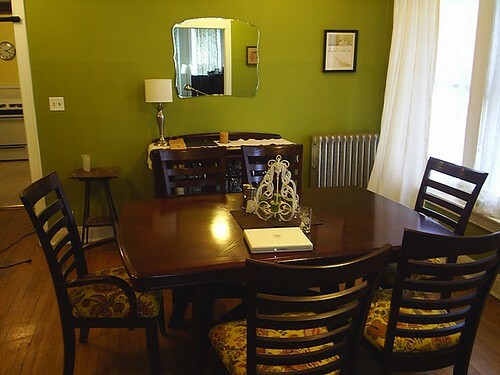 We decided to recover them in a bright teal to give some color to our gray dining room. We picked up the home decorator weight fabric at a discount fabric store for $2.99/yd. We actually bought five yards of fabric, but we could have easily gotten away with only half of that (or about $7.50 worth of fabric). To start, you simply remove the seats from the chair frame. These were held in place with four screws on the corners, so it was an easy removal. 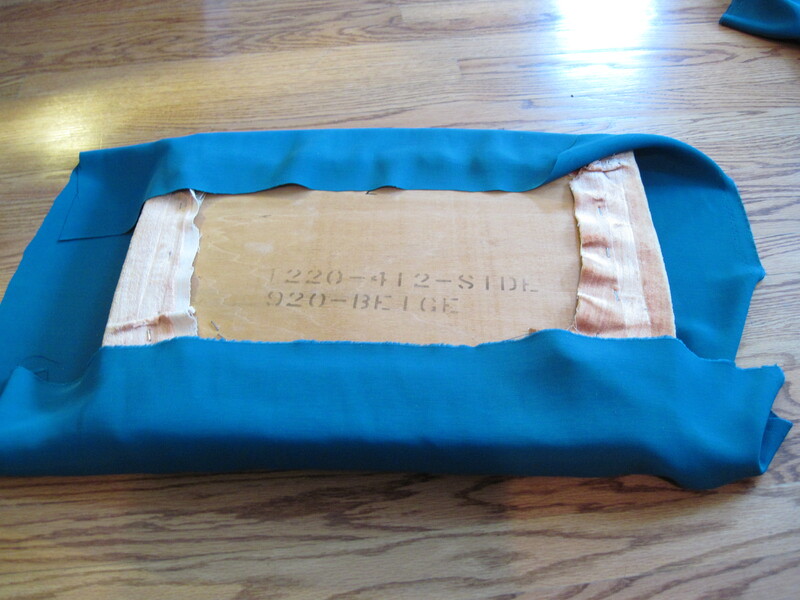 Then, we cut the fabric to fit over the seat with about a three inch overhang all around. Next, we pulled the fabric tight on one side and put a staple right in the middle of the fabric, then added a couple more on that side. 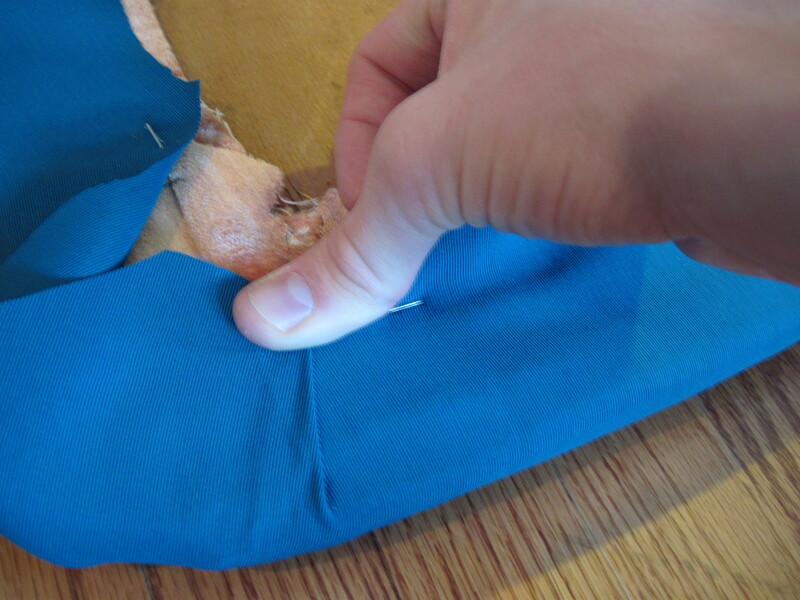 Do this all the way around the seat, making sure to pull the fabric tight as you go. It’s sort of like stretching a canvas over a frame or a drumhead, though not necessary to be that tight! We put three staples on each side, avoiding the corners by a good couple inches all the way around. The corners are the only moderately tricky part. 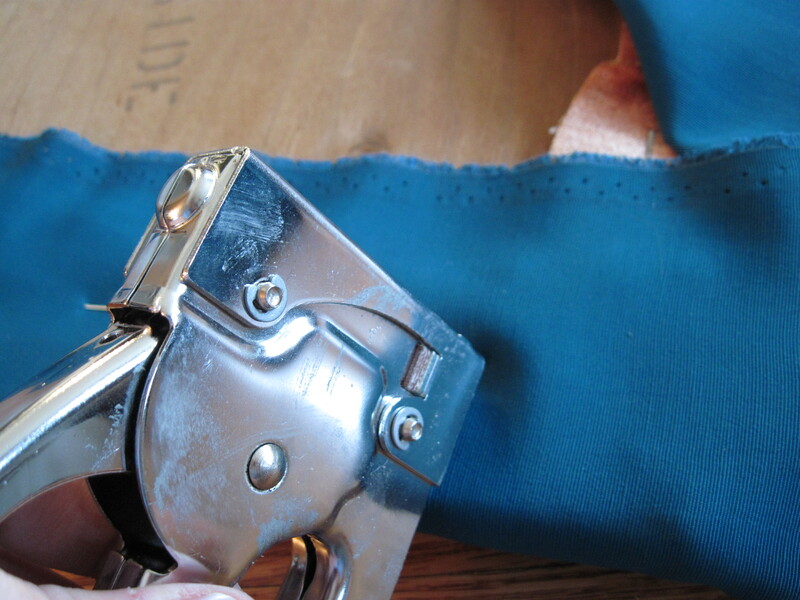 To start, we trimmed off much of the excess fabric all the way around the seat. Then, we started on one side of the corner and made multiple folds all the way around the corner, stapling each fold down as we went. You sort of have to just play with this step to ensure that you’re getting the corner covered without too many wrinkles poking out the sides. If you want, turn the seat over a few times to make sure you’re not leaving a wrinkly mess. Once the corners are done, you’re done recovering and ready to attach the seat back onto the chair frame. If the corners look too wrinkled, you can always pull out the staples and try again to get them as smooth as possible. 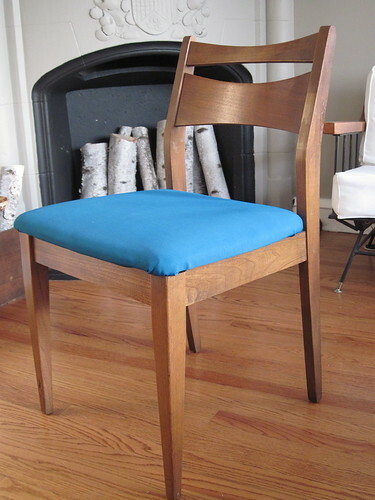 While we bought fabric for this job, we’ve been known to pick up a couple of thrift store curtains to recover a chair. In fact, the dining room suit we had when we were first married is covered in floral print curtains we picked up at our local Salvation Army. So, we sold the old ones pretty quickly (thanks, Craigslist), and we were quick to find new fabric to recover the ones we recently picked up (more on that later). With our new dining room chairs, our dining room is *this* close to being finished. All the furniture’s in place; we just need to finish a couple of things, and we’re done! Hopefully Earth Day causes us all to reflect on what we are doing to both hurt and help the earth. We try our best to consciously make good and responsible decisions. And we have made some significant changes since first being married. We’ve already blogged here about composting, switched to energy efficient light bulbs, mowing with a reel mower (yes, the mower from WAY back in the day! ), taking our own bags to stores, buying locally, and buying appliances/electronics that use less electricity. 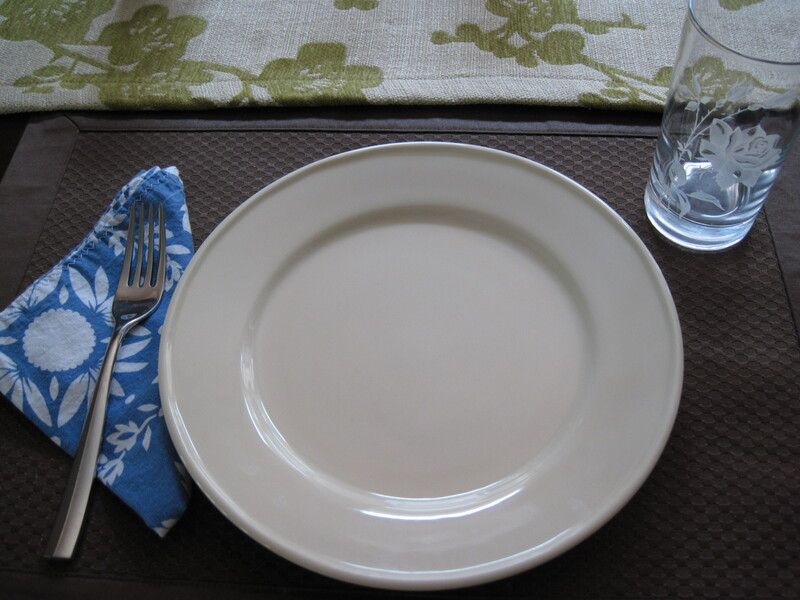 It’s been about six months since we made the complete switch to cloth napkins. Small step yes, but don’t they all matter? 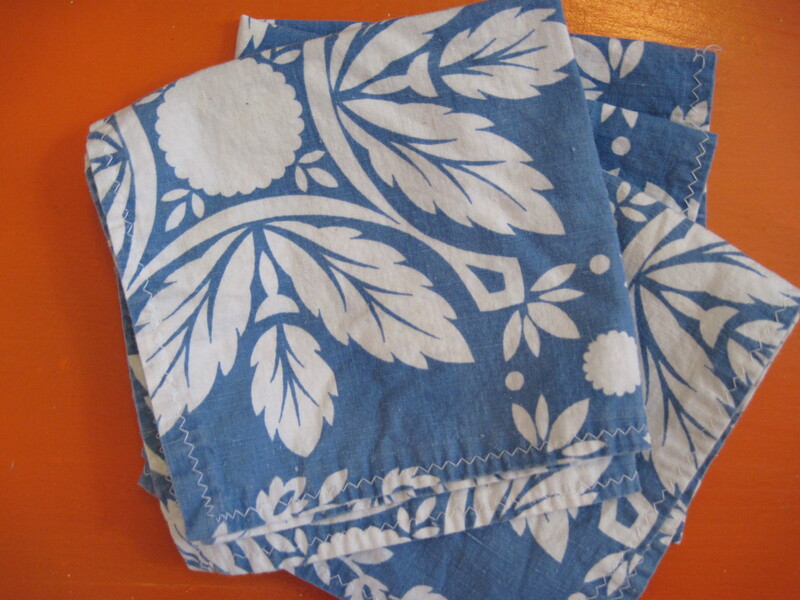 After hemming our kitchen curtains, I was left with a perfect amount of scraps to make a set of 12 anytime napkins. See? Aren’t they great? We’ve cut back considerably on using paper towels, recycle even though in means a drive to drop it off (come on, Chicago! ), and now I’m ready to work on replacing Ziploc bags. Yikes. We already try to use reusable containers for lunches and leftovers as much as possible, and I’ve been known to wash and reuse a bag or two, but I still think we can do better. For me, they are especially easy when freezing, BUT I think I can come up with another option. So here goes: I’ll report back but I’m going to be making/sewing some reusable snack bags. There are patterns all over the web. What are you doing? Do you have suggestions for next steps? 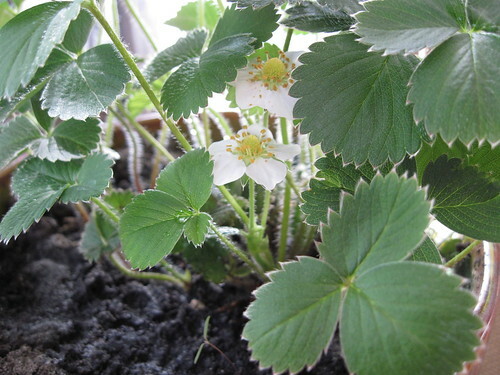 Our strawberry plant has a bloom! 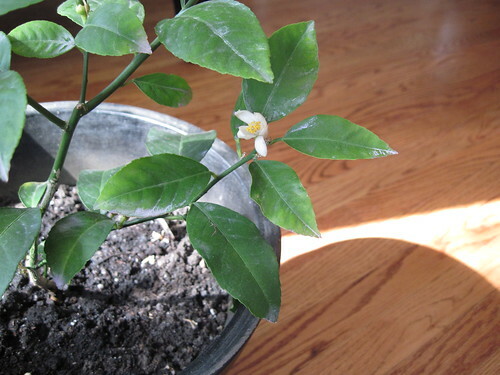 As does our dwarf lemon tree!